A vintage porcelain toilet bowl can be an aesthetically pleasing part of a bathroom. However, the porcelain is also susceptible to chipping and discoloration. 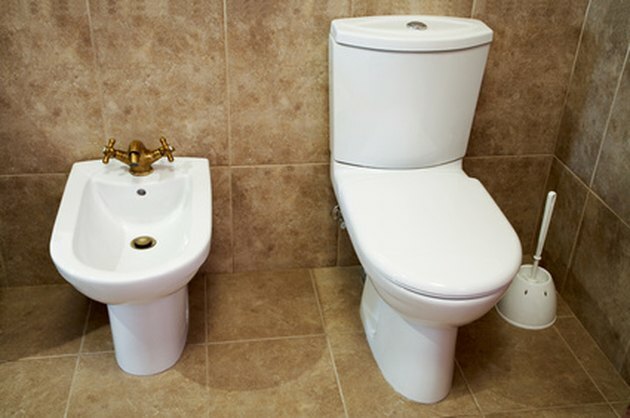 By refinishing your toilet you can restore the finish to a like-new condition. You need a refinishing kit While each kit will vary in the ideal application of the parts, the order for applying the parts remains the same. Porcelain bathroom fixtures require refinishing to maintain their appearance through the years. Mask off any areas of the toilet or near the toilet that you will not be refinishing. Use tarps to cover large areas, and masking tape both to hold down the tarps and to mask off smaller areas. This will protect these areas from damage. Clean the toilet to remove any oils and grime from the bowl. Spray the bowl clean with the low-pressure sprayer and water to remove any residual cleaning product. Repair any chips or scratches, using the materials provided in the refinishing kit. Repairs will require sanding to create a surface for the bonding agent, and a bonding agent to fill them in. Wear the goggles, gloves and respirator for this and all remaining steps to avoid injury. Apply a layer of refinishing topcoat from the kit to the bowl and allow it to dry. Repeat Step 4 two to three more times until the desired consistent look is achieved. Allow the final layer of topcoat to sit for 24 hours. Buff the toilet with the buffing agent in the kit, using the buffer. Polish the toilet using the polishing agent in the kit and a clean rag. Robert Preston is a professional writer who majored in journalism at The College of New Jersey. In addition to work for various websites, Preston has done public relations with Major League Lacrosse's New Jersey Pride organization, where he served as the team's beat reporter.